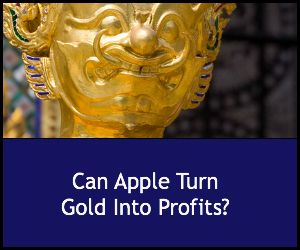 Can Apple Turn Gold Into Profits? Gold – that ancient standard for wealth and beauty – has had a roller coaster ride in the world’s money markets lately, trading down from last year and struggling against other commodities in global investing. But a new maneuver from Apple Corp is poised to change all that, as the computer giant positions itself to become the world’s third largest consumer of gold. Though gold is now trading at just over $1600 per troy ounce, that’s down from last year’s $1200 or more in US dollars. Given the volatility in the world’s currency markets, though, the “gold standard” still has value as a solid backup for the shifting fortunes of central banks in countries around the globe. Gold trading stays strong thanks to the world’s top gold consumers. China leads the world in buying gold, grabbing more gold in a year than is actually mined througo9ht the world. India comes in a close second; its Sripuram Golden Temple alone is made of 1.5 tons. of gold. Now, with the launch of its new line of smart watches, Apple may be claiming the third spot on that list. Already riding high on $180 billion in profits from its wildly popular iPad, iPhone and super-trendy computer products, Apple plans to launch its new line of smartwatches in April 2015. Entering a field already populated by competitors from Samsung, Galaxy and others, Apple’s smartwatch promises to send and receive text messages, run a myriad of apps and – oh yes, tell the time. On the low end, the smartwatch will be available for purchase at prices comparable to the iPad. But on the high end, Apple is courting a different kind of consumer with the Apple Watch Edition, which is expected to sell for $4,000 and up. Why the jump in price? The Apple Watch Edition comes encased in gold. Not gold plate, but two full ounces of 18-carat gold. And Apple anticipates producing a lot of the Apple Edition Watches – and if that happens, the company could provide a much needed boost to the gold trade everywhere in the world. According to a recent article from Gold Eagle, a trade site for the gold market, the Wall Street Journal reports that Apple plan to produce 1 million Apple Editions per month in the second quarter of 2015 alone. If that happens it could mean a massive boost to the gold trade worldwide – and good news for investors and banks. Those projections may be overly optimistic. After all, the Apple Edition is a niche luxury item. But if Apple does produce this high end watch in the numbers it expects, that’s 24 million troy ounces of gold a year – approximately, as Gold Eagle points out, 746 metric tons. Worldwide, about 2500 metric tons of gold are mined each year. So if Apple’ production estimates are right, or even close, the company would be using about 30 percent of the world’s gold supply to make the Apple Edition model alone. In many ways the estimated impact of the Apple Edition Watch product on world gold markets is speculation. Even for a company known for its line of cool, high-end devices, the Apple Edition comes with a hefty sticker price – and it remains to be seen whether consumers will bite. But Apple has never been shy about pricing its products higher than its competitors – and it still outsells them, creating a massive international presence that generates more revenue than many small countries. It is, as Gold Eagle points out, the ultimate validation of the “if you build it, they will come” strategy. Holmes, Frank. “Could Apple Buy a Third of the World’s Gold?” GoldEagle. goldeagle.com. 2 March 2015. What’s Next For Fannie Mae and Freddie Mac?